I was trying to figure out how I could come up with an artpiece for my 2007 word and just kept drawing a blank ...hee ... pun intended :) . Our pastor's message today was about something along the very same lines, and finding time to give up just 15 minutes a day of our hurried-ness, or our busy-ness. We are calling it Gap Time in our house because when you have teens, words like quiet time, or personal devotions only elicit monstrous sighs and eye rolling. But really, the first 5 minutes are for quietness, just quietness...BREATHING! Fits perfectly-eh?! The second five minutes are for devotional reading- that's it, only 5! I think they can take that in stride. And the final 5 are for giving the day and everyone we encounter in it to God. I really like the idea, and will try to find some good sites to hook the boys up to to keep them interested in devotions. But this is the artpiece I will make into a simple little fridge magnet and a card to keep in my car/purse as a gentle reminder. 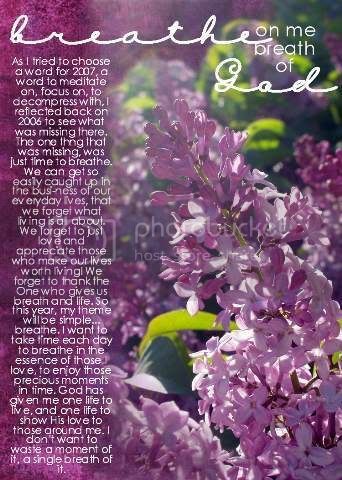 Lilacs...just reading the word and I can almost smell their sweetness, feel the Spring in the air. Oh I LOVE THAT!!!! I wouldn't mind trying that either. Isn't it incredible how we NEVER think to stop, unless we MAKE ourselves? This world has become too crazy! Good luck, and I LOVE lilacs too. Oooooh - Laurie - this page is PERFECTION!! MUST find it's way to be published!! AWESOME AWESOME! !